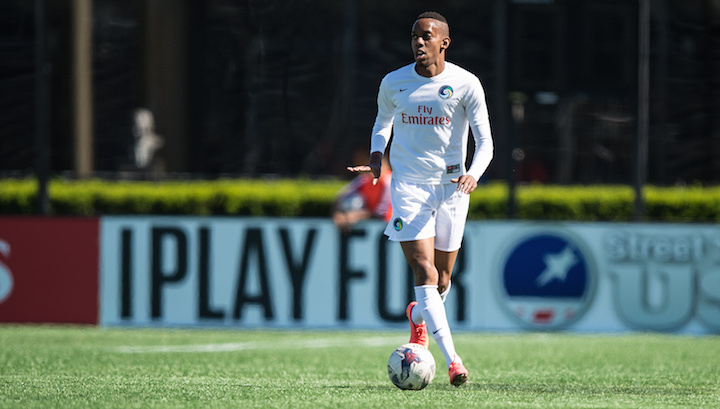 New York Cosmos B vaulted to the top of the NPSL's North Atlantic Conference standings with two big wins over the weekend. New York Cosmos B's first opponent of the weekend were the second place Seacoast United Phantoms, who entered the fixture with four wins, a draw and a loss in their 2015 National Premier Soccer League (NPSL) season. Cosmos first team goalkeeper Kyle Zobeck, returning from a hand injury, made his first start for Cosmos B against Seacoast United and registered a dominant performance, holding the Phantoms scoreless for the duration of the match. On the attacking end for Cosmos B strike partners Carl-Oscar Andersson and Miguel Herlein made their debuts and quickly found a rhythm that they'd build on throughout the weekend. Cosmos B held a significant edge in meaningful possession in the first half against the Phantoms, and their tireless movement forward paid off in the 40th minute. Midfielder Travis Pittman's corner kick was expertly volleyed by Herlein into goal, and the visitors took the lead before halftime. The second half featured more chances for Cosmos B, and it was Herlein who proved the catalyst again for a second goal with just under 20 minutes left in the match. His chip over the Phantoms goalkeeper ricocheted off the crossbar, and midfielder Julian Stahler was there to finish the job via a header. Cosmos B held on for a 2-0 final and seized first place in the division. Sunday's matchup with Greater Lowell United FC in Massachusetts saw Cosmos B put together one of its most complete performances of the season. Zobeck again kept a clean sheet, Herlein netted a hat trick and the visiting side was ahead 4-0 at the half. Midfielder Ruben Bover, who made his debut for the first team June 13 in its 3-3 draw against Jacksonville Armada FC, was in the Cosmos B XI the following evening in Lowell. He was taken down making a run into the box just before the half and converted the ensuing penalty to give his side a four-goal advantage at the break. In the 56th minute Bover assisted Herlein for the Portuguese forward's third score of the match and fourth of the weekend, a slick backheel past the Lowell goalkeeper. Three minutes before second half stoppage time substitute midfielder James Caicedo added a sixth goal for Cosmos B at the near post. The 6-0 final pushed Cosmos B to 5-1-0 (WDL) in the reserve side's inaugural campaign. Next up is New York Athletic Club on Sunday, June 21 at Travers Island. Kickoff is set for 5 p.m. ET.